Cacao is pure chocolate. It comes from the bean of the Theobroma Cacao Tree, from which all chocolate is made, and in South America it is known as the ‘Food of the Gods’. Raw cacao is toxic, so all cacao products distributed around the world are actually the result of a fermentation process. The beans are either eaten whole, crushed into nibs or ground into a fine powder. Not many people have experienced 100% pure, unprocessed, natural chocolate, and it is one of our tastiest super foods. Pure cacao is 100% natural and contains no white sugar, milk, saturated fats or hydrogenated oils like most chocolate, or any other added ingredients. Cacao is packed full of goodness and has many unique properties, unlike conventional chocolate. Cacao is loaded with active anti-oxidants, live enzymes and a plethora of phytonutrients. Cacao is a top source of of magnesium in food. Magnesium balances the brain’s chemistry, builds strong bones and promotes happiness. Studies show that 80% of us are chronically deficient in magnesium. As well as magnesium, most people in the west also have a lack of sulphur in their diets. Cacao is also high in sulphur which is one of the most important building blocks in our bodies. It is known as the ‘beauty and healing mineral’ as it helps to build strong nails, shiny hair and beautiful skin. It also detoxifies the liver, supports the functions of the pancreas, promotes circulatory health, and decreases inflammation. A study at Cornell University showed that Cacao powder has nearly twice the antioxidants found in red wine and up to three times the amount found in Green Tea. Research has shown that the antioxidants in Cacao are very stable and highly bioavailable (readily absorbed by the human body). Pure Cacao is truly one of Nature’s most remarkable anti-oxidant foods. Archeological evidence of Cacao cultivation and fermentation dates back to early as 4,000 years ago in Central America. 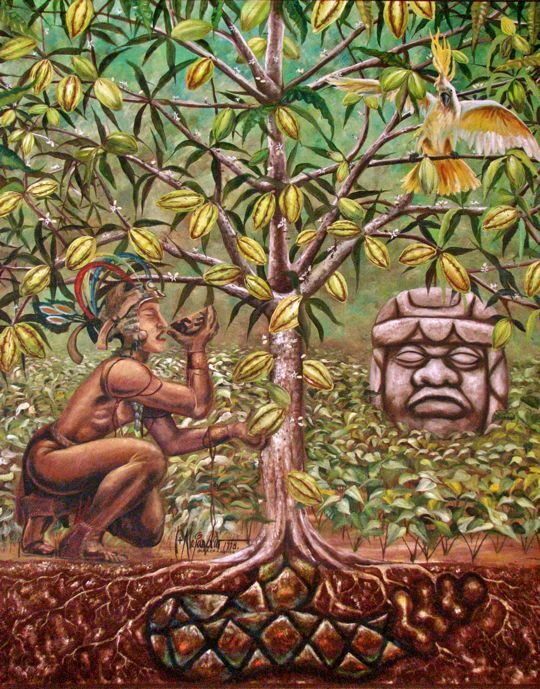 Mayas and Aztec attributed divine origin to cocoa tree (brought by god Quetzacoatl). The precious cacao beans were used as a currency, and to make a fermented beverage that was consumed in golden cups for rituals. The sacred beverage called “chocolatl” was consumed from golden cups. Recent studies have shown evidence that domestication for the cacao pulp product may date to as early as 21,000 years ago when the climatic conditions of the ice age would have limited the trees habitat to a small region on the borders of Peru, Colombia and Brazil. The cultivation for beans would have happened later in Central America. Spanish explorers first encountered cacao in the early 1500s, and the popularity of cacao-based beverages grew from Spain into France, England and much more of Western Europe by the 1700s. The first chocolate bar was not made until 1848. As of 2003 global cacao production covered over 17,000,000 acres and was producing over 3.5 million tons. The quality of something has everything to do with how it’s produced. Traditionally, “fine” chocolate has only been concerned with taste, with how the experience is for the person who’s eating it. We believe that anyone who can enjoy tasting something while knowing that it’s made by slaves, is themselves a slaver. The quality of something is as much guided by its story and eco-social impact on the world as its taste. Just as animal rights activists demand that meat production operates in a humane manner, we must expect the same from our plant based products and their business models. Regenerative Cacao is a statement that the Food of the Gods must be a creative force, and not a destructive one.